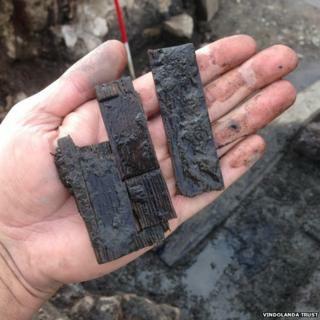 Archaeologists have unearthed a stylus wax tablet at the site of a Roman fort on Hadrian's Wall in Northumberland. Believed to be from 105-120AD, the tablet was found just 12in (30cm) from a wooden toilet seat discovered at the same location last month. The tablet is one of 12 found at Vindolanda this year and one of seven found from the same building level. Director of excavations, Dr Andrew Birley, said he was "looking forward" to reading the tablet's text. The site, near Hexham, has previously revealed gold and silver coins and other artefacts of the Roman army. Dr Birley said: "If we are really lucky the person using the seat will have had verbal diarrhoea and we will be able to get their personal thoughts about life 1,900 years ago." The Romans used wooden tablets covered with a layer of wax for writing. They would scratch words into the wax using a stylus.